Happy Valentine’s Day, Ken and Barbie. I know you wanted your dream home, but failed. Where did you go wrong? You chose the wrong agent. Don’t hire an agent who is actively selling houses. If your agent works in a firm that sells houses, that agent or one of her colleagues could have a vested interest in getting a particular house sold. The company has a client: the seller. Getting that house sold matters to the agent who is listing it, and to other agents in the company. That’s going to encourage your agent to talk-up the features of the house and gloss over its negatives. No matter how professional she may be, she works with those people every day! It may be her listing. It may be her colleague’s listing. She may be looking to garner favor in the office by bringing a buyer dumb enough to not care that their bedroom is in public view to the whole neighborhood. Safety is very subjective. Any agent who is telling you that a house is safe is doing you a disservice. Everyone has their own deeply-felt sense of safety. No one can tell you what is safe for you. Consider risks to safety that most people agree on: locks, lighting. Your house should be equipped with safety features that are common to your part of town. If everyone has locks, you should, too. If everyone has alarms, or bars on the windows, find out why. Safety also includes useful outdoor lighting. If it isn’t there, can it be added? Before starting to house-hunt, spend some time looking at crime incidents in neighborhoods you are considering. Knowing that one is significantly worse — or better — than the others can help you choose with your eyes open. Safety may include scouting out the route between the house and the mass-transit stop you intend to use. Are there creepy dark sections of road along the route? Is it safe to walk or bicycle home at night? Good agents help you find a house that suits your lifestyle. Privacy: Small differences in window location matter. If a large bedroom window overlooks the street or is easily seen from the neighbor’s house, this limits your privacy. Your agent should have reminded you that everyone can see into your bedroom. In this case, not just through the empty window frame, but also through the wide-open wall. 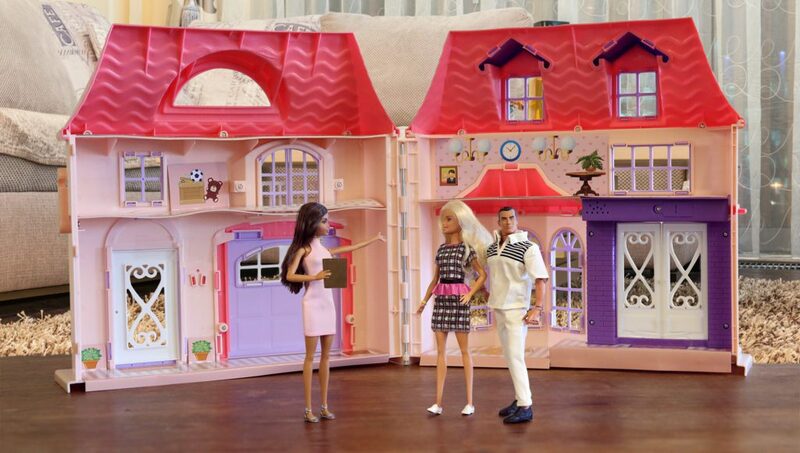 I find it hard to believe, Ken and Barbie, that you would want your bedroom on public display. You do seem like nice people. Maintenance cost: Some house features require more (or less) upkeep. Energy costs vary a great deal from house to house. Some house features need more attention than others. Did your agent discuss with you why the pool was unfilled? Does she have access to qualified inspectors who can check out that pool? Do you really want to take care of a pool? Yes, your house is plastic-sided, so it won’t need costly painting. That’s good. But, does Mattel make replacement parts for that siding? Can you use a Fisher-Price shingle, or does Mattel have the monopoly on ones that fit? Your agent didn’t mention what an energy hog this house is. A modern house would be built to LEEDs standards. This one is older; and she said charming. Imagine what you heat and air condition bills will look like! Old construction, open walls, no window glass. What a nightmare. If you move to the Boston area, please contact us. We can do better.